I just opened six from the weeklies, and all six were the lowest possible draw (three white, one blue). I kind of wonder if they make the game better or worse. Edit: I'm a doofus, should have left the weekly boxes until after the holiday starts. Don't be like me! The contents of the loot box are assigned when you earn them, so if you had waited and opened during the event it would have been all pre-event loot. Yeah, but if you wait to play your arcade games later in the week, the 3 you earn will be for the event. I plan to do this. Weekly bonus boxes get earned when you win matches in arcade mode. I'm saying earn this week's after the holiday starts. Sarcasm quotes. You missed them. Huh. I guess Blizzard never played Unreal Tournament back in the day? Using the translocator would cause the flag bearer to drop the flag. I'm genuinely surprised they didn't do that with movement abilities in the first CTF attempt. I am curious if Lucio counts for movement, at least if you are not playing as Lucio. It would be potentially problematic if your teammates could force you to drop the flag. Oddly enough, the option for making characters drop the flag on movement powers has been in the custom game options since the mode was added. Haven't played with them much, so now sure how that works with Lucio. Pushed through Watchpoint first point fairly easily on attack. Think our team got some picks and my trusty buddy Zen (CanadianSandals) and I happily marched the payload around. The opposing team then was removed of all game awareness between points 1 and 2 as they entirely forgot the payload and the Giant Powder Blue and Orange German Man standing on the slowly hovering flying car was not enough to snap them out of their fugue. So far, pretty boring story right? Random internet strangers lack cooperation, cannot figure anything out, and fail to achieve their objective. Welcome to 2018! The opposing team, rose from their slumber, a roaring monkey came soaring over the ramparts to deal with our DPS/squishy heavy lineup. Their Widowmaker remembered her calling, landing snapshots with abandon. The enemy recruited the bane of all Goodjer existence to our midst: THE SCATTER ARROW!!!! 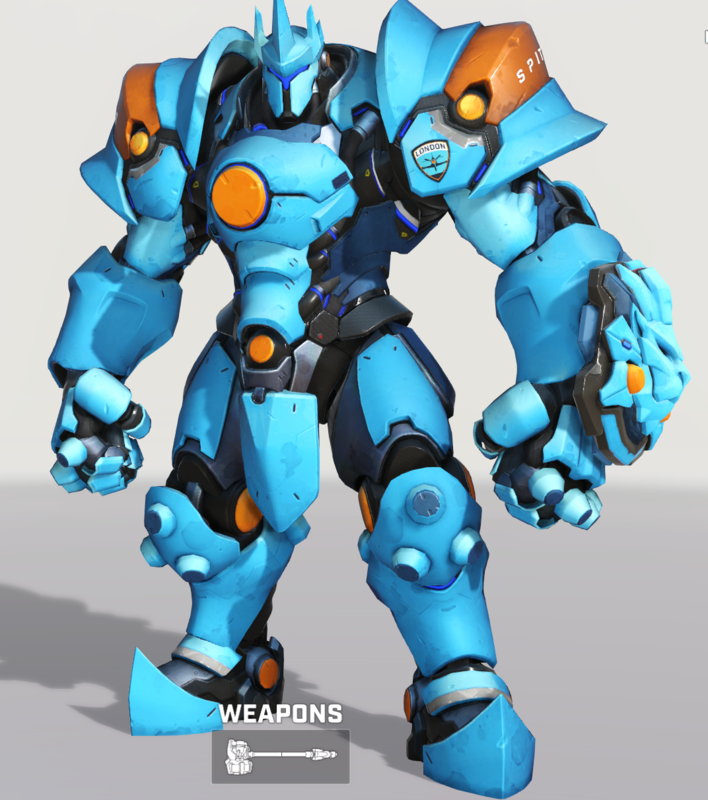 Soon, my poor Powder Blue corpse was littering the battlefield, over and over, CanadianSandals trying to keep me alive with his sparkling orbs of health while the monkey tickled me with his Tesla Cannon and McCree flash banged me back to my days fighting alongside my mentor Balderich von Adler in the Omnic Crisis. Bastion doing his best to solo reenact the Maginot Line, perched upon the cart, daring our suddenly timid Genji to duel him. Our answer? Widow turned DVa believed a sneaky hacker would help. But Sombra was no match for the potent, though still disjointed and incredibly over aggressive foes. No amount of "Let's Group Up", "Wait for Me", or "Let's attack the objective" could corral our flailing team. And so for the next six agonizing minutes, Zenyatta and Reinhardt lived out their own person version of Groundhog day. Spawn. Slowly move forward. Die. Repeat. I like staygold story time! So, six of us knocked out 3 matches of Competative last night. Three decisive and well coordinated wins. Pretty diverse comps as well, from pure dive to capture the first point on Eichenwalde for the win to a triple tank + Moira. Fun first foray. Switched over to QP and played better teams than we did in comp. Given that only two of us had finished placement matches, I assume we were playing other teams doing placement as well? So, six of us knocked out 3 matches of Competative last night. Three decisive and well coordinated wins. Pretty diverse comps as well, from pure dive to win capture first point on Eichenwalde for the win to a triple tank + Moira. Fun first foray. Oh man. I missed this last night? I popped on around 8 and saw that no one was on. I played one solo arcade match before logging off. Guess I need to stay on longer. There was a GWJ custom match when I logged on at 9:15 cst and when others left, we had six remaining (Axel, Erik, Medmey, Minotaar, staygold, and myself) and just decided to try it. Fortunately, we had no baby or work call interruptions. I think we all played two or three different heroes across the games. Rumours swirling around that Geguri is signing onto the Shanghai Dragons (along with a couple of other Korean players) to get them out of their losing streak. That's definitely unexpected, I was expecting her to go to one of the NA teams. All free-agents who sign up with teams will be eligible to play in OW League stage 2 starting Feb 21st. I sucked last night. Could feel my game was off so just parked in my Mercy comfort zone. Thankfully we have enough skill/organization/call-outs to smooth over an individuals short comings. Sorry I missed that. I love comp. I hate half of the people who play comp. Dang, not my impression at all. You killed it on "New Mercy" along with the call outs. Still don't know how you pulled of that rez of my D'Va on the second point of Volskaya that let us take the point. Seconded. The comp matches last night felt fantastic, and your Mercy was definitely on point. Another kudos to BH, our resident comp den mother. Another kudos to BH, our resident comp den mother. I'm trying very hard to learn Doomfist, but wow is he hard to play. It seems like he's countered by almost everyone and doesn't do anything that can't be done better by another character. Yoohoo! Hero skin change on character select screen will be live with the update. Grr. Why must Blizzard reset my weekly Arcade wins two days before a new event starts? Been sitting at two wins for two days now and my OCD prevents me from going for a third. Now you can select your hero skin during pre-match countdown.. Bout time! Doomfist plays best on defense and any map that has some high ground that he can access. The rotation I used to become productive with him was by Seismic Slamming from above, one shotgun blast, Rising Uppercut, shotgun until dead, Rocket Punch to safety. If you do not save some of your movement skills to escape then you are going to be trading a kill for a kill, which isn't much help. Doomfist may be a suboptimal choice for DPS a lot of the time, but when I get in the groove with him, he is probably the most entertaining character to play. I especially enjoy him in deathmatch, to which many of you can attest. Yup. Erik could change his avatar to Jesus holding a baby Doomfist and I wouldn't even blink. Hog emote is nails as well. I screwed up and finished 6 of my weekly arcade games last night. Oops!